The 1986 meeting in Iceland between U.S. President Ronald Reagan and Soviet leader Mikhail Gorbachev was like none other. It offers helpful context for a potential U.S.-North Korea arms control summit. To help readers better understand the nuances of foreign policy, CFR staff writers and Consulting Editor Bernard Gwertzman conduct in-depth interviews with a wide range of international experts, as well as newsmakers. The on-again, off-again plans for a summit between U.S. President Donald J. Trump and North Korean leader Kim Jong-un have spurred discussion of the risks and rewards of such meetings. One extraordinary Cold War–era summit, between U.S. President Ronald Reagan and Soviet leader Mikhail Gorbachev in Reykjavik, Iceland, in October 1986, provides useful context for any eventual Trump-Kim meeting, says CFR Senior Fellow Stephen Sestanovich, who was on the staff of the National Security Council and part of the president’s team at that event. Reykjavik is notable for a number of reasons, he says: it was called on short notice, involved real negotiations between leaders, and brought forth a surprising Soviet proposal to abolish offensive nuclear weapons within ten years. “The real drama of Reykjavik—and the reason we remember it—was the spontaneous personal contest between the two leaders,” Sestanovich says in a written interview. President Trump has canceled his June 12 meeting with Kim Jong-un in Singapore, although there are signals it could be back on. You were part of a pretty unusual arms control summit yourself. Does Reykjavik help us understand what happened with Trump and Kim, or what still might happen? Was the Liberal International Order All That? Let’s start with the differences between the two events, since they underscore how truly unusual the Singapore meeting would have been. Sure, it was a surprise when Reagan and Gorbachev said that they were going to meet in Reykjavik, and on less than two weeks’ notice. But it wasn’t going to be their first encounter. They’d already had two days of talks in Geneva the year before. And it wasn’t going to be a summit in a vacuum. Teams of Soviet and American negotiators had been at work on a host of issues, especially arms control, for years. The two leaders had written each other detailed letters in the months before they met. They’d even agreed in principle to hold a summit in Washington. The Reykjavik meeting was supposed to be an interim conversation, to make sure there was enough agreement for Gorbachev’s Washington trip to go forward. To remember Reykjavik is to see how truly unpredictable the meeting between Trump and Kim would have been, completely uncharted territory for both leaders. That’s probably one reason you saw the two of them, almost from the moment a summit was agreed to, playing public mind games with each other. They were looking for some sort of psychological advantage in the run-up to sitting down together. Weren’t there similarities too? Reykjavik got pretty wild pretty quickly. To remember Reykjavik is to see how truly unpredictable the meeting between Trump and Kim would have been. It did. When you bring two powerful national leaders together to solve a hard problem, it’s a roll of the dice. You don’t know what’s going to happen. Remember, that’s one of the reasons Gorbachev proposed the Reykjavik meeting in the first place. He wanted to make more progress than his negotiators had been able to. And his idea for how to do this was to “sweep Reagan off his feet”—that’s how one of Gorbachev’s advisors described it afterwards. In that sense, it was a kind of trap. No one really saw Gorbachev’s big proposals coming. Trump and his advisors probably felt something of the sort was in store for them. Aren’t there ways to prepare for a meeting like that? It’s easy, of course, to write the memos that sketch out the positions the other guy has taken in the past. You can also try to describe the many things that may be on his mind. But you can’t be sure what conclusions he’ll draw for the meeting ahead. Before Reykjavik, Jack Matlock—who was Reagan’s top Soviet advisor on the NSC staff and a superexperienced Moscow hand—was asked to play Gorbachev in a dress rehearsal session with the president. He even did it in Russian, with a State Department interpreter present to translate his statements for Reagan. This was great prep, except for one thing. Jack admitted he had no idea what Gorbachev would say. Just imagine how much harder it would have been for one of Trump’s advisors to play Kim Jong-un. Some diplomats say leaders should hold summits only to sign off on preapproved agreements. Is it a bad idea for them to do real negotiating? The Nixon-Kissinger ideal was that all summits should be, as they liked to say, “carefully prepared.” That way, you avoid surprises. You also give the other side an incentive to make concessions, on the assumption that they may be willing to pay something to get the high-level meeting. By this logic, you try to have only a few details left for the leaders to resolve. Sometimes you can only learn what you most want to know by letting the big guys go at it face to face. There’s lots to be said for this approach, but it doesn’t cover every situation. Sometimes you can only learn what you most want to know by letting the big guys go at it face to face. And if some surprise proposal gets put on the table, the president has his advisors at hand ready to evaluate it. In your scenario, it’s all right for the leaders to try their hand at negotiating, as long as the professionals are behind the scenes as a kind of insurance policy? Still, the professionals can only do so much. The real drama of Reykjavik—and the reason we remember it—was the spontaneous personal contest between the two leaders. The experts and the professional diplomats couldn’t substitute for that. 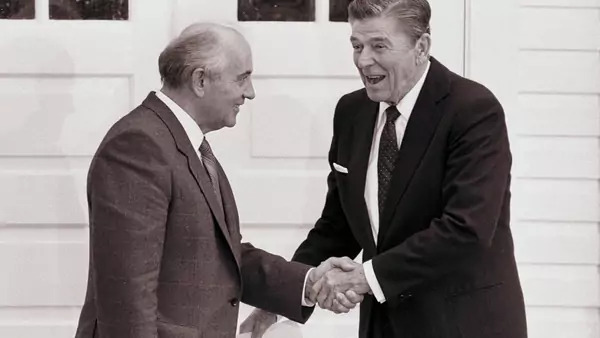 Gorbachev had to see what Reagan might accept, and what he wouldn’t. The leader of the Soviet Union sat across from the president of the United States and found out that he could push him so far and no further. Nitze and Shultz couldn’t have told him that. Gorbachev learned a huge amount from the meeting. There’s a reason the big breakthroughs in Soviet-American relations—and in Gorbachev’s own reforms—came after Reykjavik. There were many reasons for Trump to call off the Singapore meeting this week. But let’s not pretend that nothing was lost by doing so. Trump and Kim would both have learned some things about each other that they can find out only by talking. My guess is, they probably both have some regrets about it. Their advisors may feel relief. The big guys probably feel regret. That’s what Trump seems to be saying when he talks about how it still might happen. Isn’t one of the problems with these unscripted summits that you don’t know when to call them off? Didn’t people at Reykjavik say, if only Reagan and Gorbachev would keep at it another day, they might agree on something big, like abolishing nuclear weapons? That was what some of Reagan’s advisors thought at the time—that some sort of breakthrough was in reach if only they’d keep talking. Some of them felt that if only Mrs. Reagan had been there, the president would have been willing to stay over another night. Then the experts could have had yet another all-nighter! I tend to disagree. The two leaders had been butting heads for two days, and Reagan was pretty fed up. He wanted to make clear that the U.S. would not make the kind of compromises that Gorbachev had come to Reykjavik hoping for. Once that was clear, there wasn’t much point in continuing to haggle. At Reykjavik, it was the president who was our insurance policy, not the professionals. The same question, whether to keep talking or go home, could easily have arisen in Singapore—and will surely arise if the meeting ever happens. Trump’s advisors, like Reagan’s at Reykjavik, will have their own views, but in the end it’s a decision—a gut call—that the president himself has to make. This week, I suspect, Trump and his advisors saw how hard it was going to be to manage the process. Maybe they realized they weren’t ready for that kind of high wire. How hard is it to avoid having a summit blow up the way you’re describing? Why not just have a draft statement ready in which the two leaders underscore their commitment to continuing dialogue, shake hands, and go home? A great concept, but sometimes hard to execute. When the Reykjavik summit ended there was nothing gracious or elegant about it. The two leaders were pretty peeved at each other, and their last session ended sooner than we staffers expected. I was settling in at my typewriter with the assignment of drafting a high-minded statement of regret for the president. Suddenly, we heard the meeting was over; everyone started rushing out of the building toward the motorcade, not knowing what was going to happen next. Shultz tried to buck the president up, but without much luck. The person who saved the situation was Gorbachev. He went into a huge press conference and touted the whole event as a breakthrough—mainly, I think, because he didn’t want to go back to Moscow admitting failure. In Singapore, wrapping things up could have been—and may yet be—equally wild. What the leaders want to say about their meeting always depends on what they think will serve their interests internationally and, especially, back home. They might choose a tough line; they could choose a conciliatory one. And they might not agree. What you say at the end of a summit is always up for grabs. Presumably social media messaging only makes that problem harder. You didn’t have to worry about that at Reykjavik. Absolutely not. We didn’t have to worry about how to spin the meeting while it was going on, and we certainly felt we had time once it was over to shape public understanding of it. The president didn’t comment publicly on the summit until the next evening, in a televised address. Social media would have changed things completely at Reykjavik. We’d have been thinking about our message at every step of the way, and we would have felt we were in a battle, from the very moment the summit ended, to determine how it was covered. Reagan would surely have been tweeting on the plane ride home. We know Trump would have been. Japan’s United States–imposed postwar constitution renounced the use of offensive military force, but, Sheila A. Smith shows, a nuclear North Korea and an increasingly assertive China have the Japanese rethinking that commitment—and their reliance on U.S. security. Technological innovation and strategic competition appear to be increasing the risk of nuclear war. Mending the fraying international nuclear nonproliferation and arms control regimes should be a top global priority.